A few years ago I met photographer and author Lori Eanes when she came to take pictures of my garden for a book she was doing. 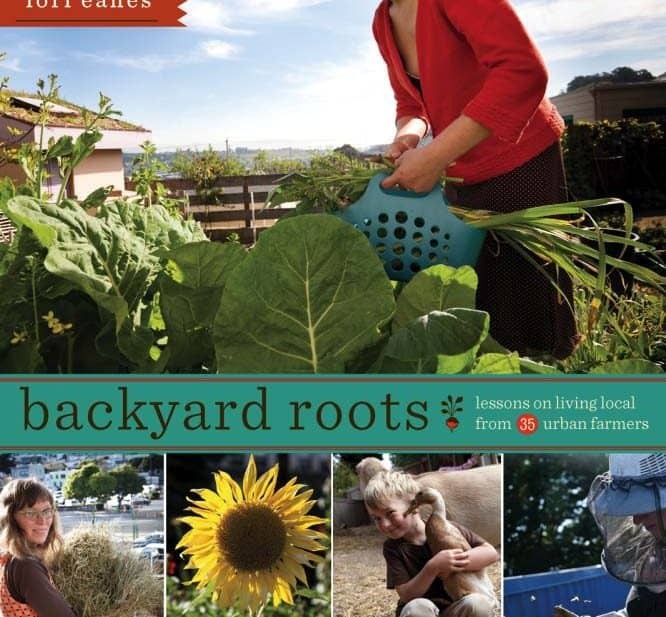 The book is called Backyard Roots: Lessons on Living Simply From 35 Urban Farmers, and it’s a highly visual exploration of urban farms up and down the west coast from Vancouver to San Francisco. 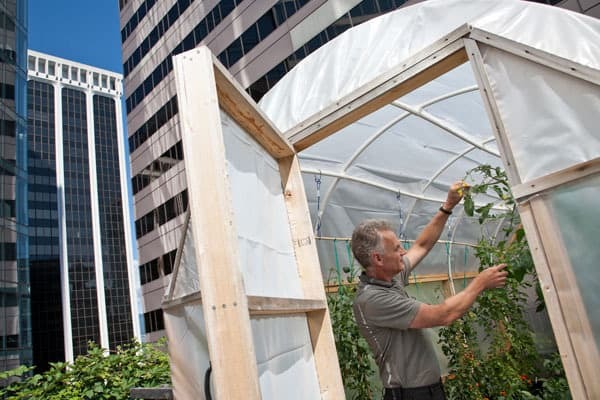 Thirty-five urban homesteaders are featured, and through their stories and the photos and descriptions of their set-ups the book covers the full range of urban farming activities. 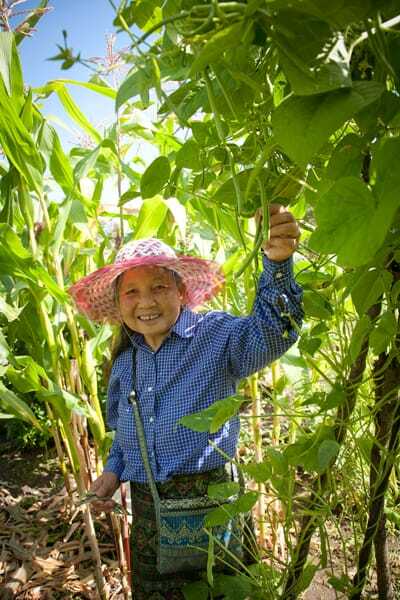 The farmers in Backyard Roots pluck vegetables from their raised beds or permaculture food forests or rooftops gardens. Greens and herbs are foraged, ornamental public trees are covertly converted into fruit-bearers through guerrilla grafting, fresh exotic mushrooms are grown for farmers markets and restaurants. People share their focus on self-sustainability or work to bring together a larger community. There are kids and critters in the mix: toddlers and teenagers, chickens, goats, ducks, fish, and bees. 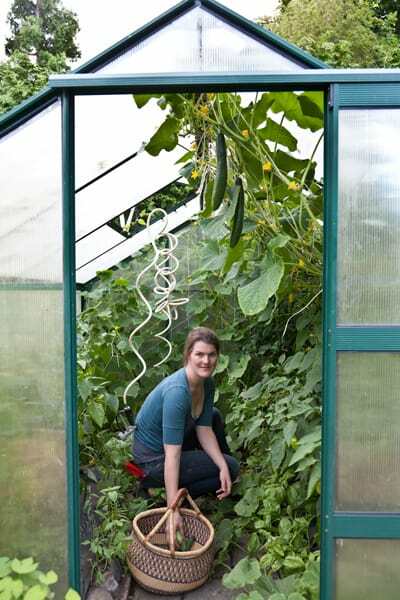 I’m in there too, with my kids and my Felcos and my greenhouse full of cucumbers and my advice to think like a plant. It’s a trip to see yourself in a book (I hadn’t cut my hair in eighteen months, and you can tell! ), but it’s been wonderful to read through all the stories, and to show my kids pictures of other families doing the same kind of thing we’re doing. Backyard Roots gives a stong visual tour of what it is to be a west-coast urban farmer. It is a fabulous work for inspiration that really captures the diversity of weirdos like me (and maybe you?) who think that ripping up lawn to grow veggies or graze farm animals is a great idea – even in the city. 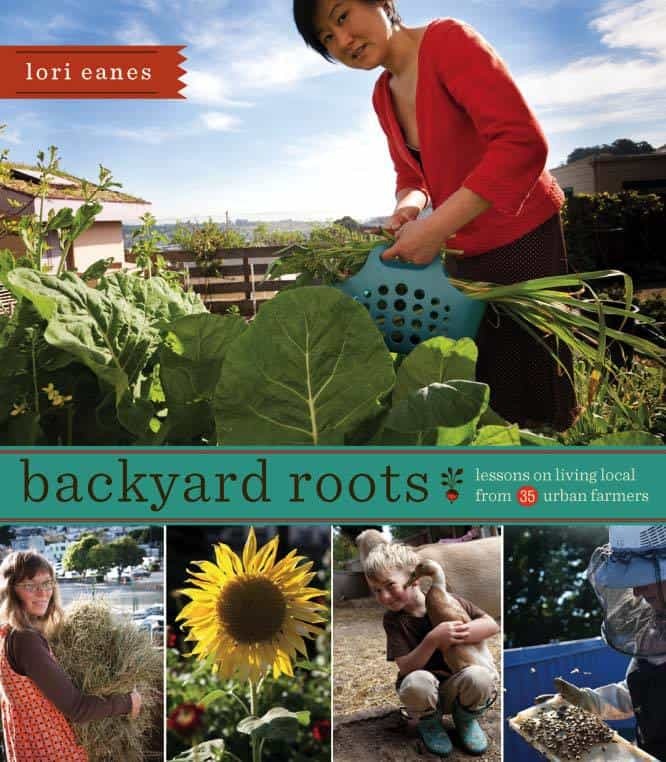 Get Your Own Copy of Backyard Roots – Free! Skipstone Press, the publishing house of Backyard Roots, is giving away a copy of Backyard Roots to three lucky NWEdible readers. To enter to win, leave a comment on this blog post telling me what kind of urban (or rural!) homestead activity you find most inspiring, and what activity you find most intimidating. I am, personally, very intimidated by anything having to do with animals that lactate. I’ll take poultry and bees any day, and leave the goats and mini-cows to other, braver urban farmers. Contest will close Friday, November 29th at 8 pm PST. The three winners will be contacted by email. Open to US and Canadian residents only due to shipping. Best of luck everyone! Image Credit: All images featured in this post are copyright Lori Eanes. Used with permission. Previous Post: « Get A Shovel. This is Urban Homesteading. Scary = bees – sorta want to go there- but space SOOO limited- and truthfully- not scared off the bees so much as the idea of one more learning curve/ time commitment / mess to deal with! Most intimidating: Any bigger animals… I’m fine with bees, but even though I’d love to have some goats I’m worried about how to keep them. What if they get sick? Or break out all the time? Or…? I find your writing inspiring Erica, and that you have the time and energy to blog, can/preserve, garden and raise kids. For me, canning is the most inspirational AND intimidating part of urban homesteading. Whether with produce from one’s home garden or the farmers’ market, it takes a major – if short burst – of energy most folks can’t make time for. BTW – I’ve just built two hugel beds for next year and am very excited to see what happens. i’ve been reading your blog for a while and find it so motivating. what inspires me is the “lifestyle”, what you do and how you live. taking responsibility to feed yourself and your family. so cool. over the past two years, my husband has planted a dozen fruit trees and hundreds of raspberry bushes; i have put in a hen house that is full of egg laying beauties! now this may sound strange, but as much as i am “all in” with my chickens, i am intimidated with gardening. i always have issues with what i plant not growing for some reason or another. it’s like a puzzle to me and i can’t put it all together. are you offering internships? thanks for taking the time to blog about your experiences, it makes such a difference in the lives of your readers. focus on the positive, and compost the rest! What I find most inspiring are the people who push back and take a stand against their local zoning boards and neighborhood associations who dictate that no food crops may be grown where they can be seen from the street or that food crops may not be grown or what have you. My former roommate’s mother has been working for several years to gain permission to have her vegetable garden in the front yard where there is more sunlight and better growing conditions. There are some pretty crazy and strict regulations about garden appearance and contents in some cities and towns. Maggie. We had an elderly lady in the church that lived in one of “those” housing development. A few of the other ladies went to her house and planted a large flower bed. On the edge of the bed were tall flowers. From the tall flowers to her house were goodies. This went on for years until the lady moved out of state. No one ever caught them. The most inspiring thing is seeing my 3yo graze on kale shoots, sorrel and ground cherries while playing in the garden, wearing dress-up with her hippo watering can and her yellow truck on a pink sparkly leash. The most intimidating seems to be winter gardening. I can’t seem to get the timing right and the pests just laugh at me at eat everything that actually grew. Oh and parsnips… growing those is intimidating too. Maybe not totally intimidating, but definitely frustrating. The intimidating part for me, is like you, lactating critters. I want them bad, but the idea of being tied down and having to be there for them twice a day consistently to relieve them is a bit daunting. But the idea of butter, milk, cream, cheese….glorious! We don’t live in an urban situation, we’re about as rural as it gets. But urban farming is so bitchin’ to me! Why not take your nice manicured (or unmanicured) lawn and turn it into something that sustains you and your family! Awesome! I didn’t know you had a greenhouse – that is inspiring. Intimidating is actually growing anything that needs warm and bright! I would like to finish our green house. We have the frame but that’s it. I would also like to keep bees but I must say that is intimidating to me. I am newly a rural homeowner and I am learning as I go. 2 chickens, 2 goats and 2 big garden boxes! I am most inspired by Permaculture and I am most intimidated by beekeeping! I absolutely want to tackle raising goats on our 3 acres this next summer. We have chickens and a garden right now. Something that I find intimidating is the garden companion planting. This first year was a little rough trying to figure it all out. I would love the tips, tricks, and advice from these wonderful people to help our backyard homestead! Thanks! I would say the most inspiring for me is the design and layouts and figuring out what grows best with what and where. There’s part of me that loves the complexity and at the same time the simplicity of it all. The most intimidating part for me is that I will eventually run out of space! I am most inspired by composting- I love returning food back to the ground to nourish more food! I’m intimidated by raising ducks and chickens..we’ve tried it once before, somewhat successfully, but next time there’s a bunch of things we’d do differently. I’d love this book!! Bees, bees, bees are most inspiring!!! I can’t wait to get my own hive! Chickens are intimidating, I’m a believer that I must harvest them when they are no longer layers. I’m not afraid to butcher, but when you’ve had them for so long…. Can I do it!?!? Animals. I did fine with my chickens for the most part, got a little stressed when one of them got their head stuck in chicken wire when they were smaller, but we all survived. The older I get, the more attached I become. As much as I would love to have a diary cow, husband won’t allow that to happen. I read about people raising their own meat and think it really is the way to go if you eat meat, for the animal that nourishes us and the person consuming it, but I know I could never butcher anything…. The book looks wonderful. I’m sure everyone’s stories are really inspiring. I’m most intimidated by animal upkeep. Self-installation of drip lines or anything plumbing related, for that matter, is a close second. Not sure why! I am falling more and more in love with Permaculture (just finished Paradise Lot a month or two ago) and dreaming of what we could do with our rental. Those guys are completely inspirational to me, as are you! I love seeing ways people maximize a small space! I’m intimidated by most animals. We have chickens for the first time, but am pretty clueless. I find raising bees most inspiring as I take on my dads passion to raise bees. I love honey for the taste and nutrients; I love bees and want to do what I can to save them. I also find raising them in an urban setting most intimidating as I know close neighbors may not be keen on them, and our HOA will find some reason to disallow them. 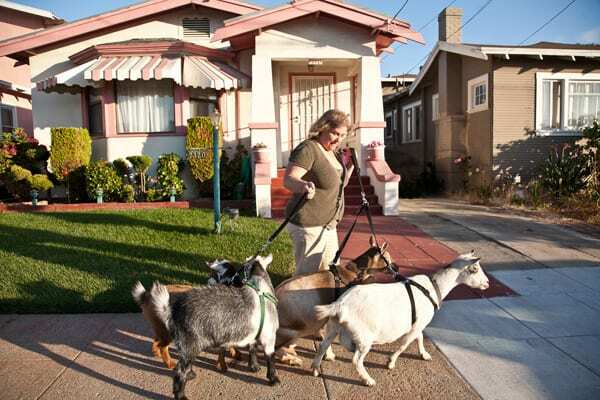 I’d love to have goats, I loved seeing the picture above of the gal walking her goats in town. We live in an HOA, we’ve managed to have our ducks go unnoticed, still trying to get up the courage to bring goats on board. What a great book! It’s wonderful to see all that others can do on their little plots, it’s definitely an inspiration. Would LOVE to have this!! Urban Farmer newbie here, this would be great! I’m inspired by all those who are pushing boundaries, but particularly those who seem to have found just the right niche for themselves. I am most intimidated by bee keeping so expect I will have a go at it as soon as possible! I’m really exicted about this book! 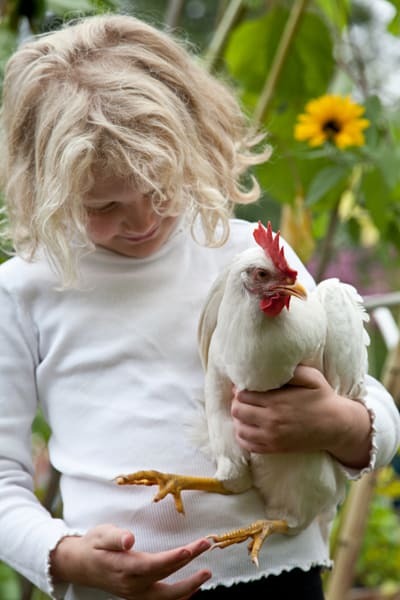 I think I find urban backyard chickens both inspiring and intimidating! I would love to be able to encorporate them into our small yard but have so many questions that it’s hard to know where to start! I love growing my summer vegetables, but am always combating weeds. Everything we grow is organic. I’m currently adding to my blueberry patch of 28 plants. Would love to have a copy of your book. Thank you, Susie. I used to find bee keeping the most intimidating. 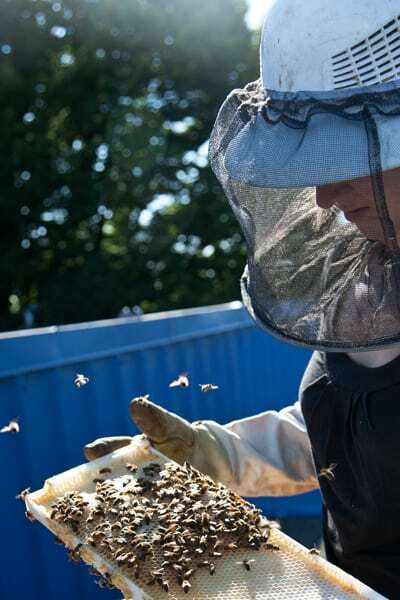 Researched and researched and now we have honey bees. I still am very timid when it comes to them. I adore my chickens. Would love to add more animals but just not sure where to go with it just yet. Most inspired by organic gardening and intimidated by gardening with all the deer around my place! I’m inspired by the volunteer veggies — potatoes, heritage tomatoes, kale (oh the kale!) — that come up year after year in various places around the garden. They always do well, and feel like the most special of gifts, something secret left in the ground by my past self for the delight of my future self. Most intimidating is the bindweed that infests my yard and can make me wish I had no interest in trying to actually control what grows and flourishes on my property. I am living for nearly 3 years now in a house next to Bulgaria’s capital. During this time I have had the opportunity to practice my hobby – gardening. The most inspiring thing I like doing is sowing seeds and transplanting seedlings – giving life to all these plants! I am inspired by people who are willing to take their food supply back from the mega growers no matter if it is just a little patch or a big one. I am inspired by the wonder in my little one’s eyes as he waits very impatiently for the carrots to be ready and by the joy he has eating various yummies straight from the garden I think if I had more room I’d have more critters. I am inspired that I am giving my kiddos a connection to the earth and outdoors and food that will last a lifetime. I am intimidated by-not much really when it comes to gardening and such – skydiving that is intimidating so not a chance of that happening. I am most inspired by seeing the success of new gardeners at our community garden and by the way neighbors stop and admire my edible front yard garden. I am most intimidated by pruning my fruiting trees and shrubs, so afraid that I’ll make a mistake…right now the mistake is in NOT pruning them. I suffer from Multiple Chemical Sensitivity as a result of a lifetime of chronic low does exposure living in impoverished and poverty stricken American neighborhoods. I have been deemed permanently disabled at the age of 38, after 8 years of being poked, prodded and otherwise for no answers (I am 41 now). I have no help from my doctors, as they still classify this as a mental illness with no treatment options available. They attribute my other symptoms to Depression, which while I do have symptoms periodically, this is NOT the cause of my illness, just an easy scapegoat as they can’t/won’t address the real issues. As a result of more than 10 years of trying to find help within the Medical Machine, I have learned that the only way to help myself is to have control over as much of what I consume as is humanly possible. I am most intimidated by the physical work of building/maintaining functional/sustainable methods for bringing a variety of nutritional and unadulterated foods to my table, and those in my community. My disability status prevents me from doing a lot of the kind of work I know is needed. It is not technically the work I am intimidated by, but the fear I cannot perform it and that I have no family to delegate tasks to. I am trying to build a network of small baby steps so that no matter what I am doing, I can accomplish each task on my own. A compilation like that which is offered here would go a long way to helping me achieve my goals as it is clearly informative and a wealth of useful information at my fingertips. I do best with tangible items like books. My extreme poverty makes it impossible to access many of the wonderful things that I know cold help me heal AND help the community as well. I also run a volunteer non profit offering services to those experiencing homelessness and/or extreme poverty (just like myself). Offering current, force free education for those with pets, helping them to build relationships with their beloved companion animals that are built on trust, respect and love, and nutrition is a large part of this (for we are what we eat) and sharing with our most vulnerable populations is vital to any community. I plan to share any bounty within my community. Everyone should have access to actual food. I love everything I see from NW Edible Life and look forward to seeing each new blog entry. Thank you again for all you do and this opportunity. Thanks for the giveaway AND for your awesome blog. I find growing my own veggies and fruits most inspiring, and bee keeping most intimidating! Inspiring: Being able to walk outside to get fresh ingredients for dinner. Intimidating: Deciding what to grow, which fruit trees to plant and what animals to have. I am most inspired by my garden every year. For years I grew tomatoes and peppers. Tomatoes and peppers, blah blah blah! My love of vegetables and all I grew was that!? Now I look forward to January. Why? Seed catalogs, of course! I love nothing better than sitting down in the evening with a glass of wine and a good seed catalog. Dreaming of warm weather and sprouting. I try to add at least one new thing a year now. Last summer it was ALLLL heirloom tomatoes. Not a single hybrid in the bunch. And Brussels sprouts, but we lost those in the very rainy weather we had. What am I most intimidated by? Chickens. And I love LOVE chickens. I am a vet tech in an exotics practice that specializes in birds. I see backyard chickens come in on a daily basis. Why am I intimidated? Because I will fall in love with them. I will be worried they aren’t warm enough in the winter, too hot in the summer, they’ll come in the house sometimes and my husband will give me that look he gives me every time a new animal shows up here… You can see how this could become a problem for me. You look sort of like the delphic sibyl from the Sistine Chapel ceiling (with cucubers). Awesome! I love the idea of canning but I’m always terrified that something will go wrong. I’ve canned fish that turned out great, then canned jam that was sour when I opened it 🙁 One day I’ll get it right.